The Mars Foundation's hopefor humanity's future on Mars is neatly summed up by their slogan: "Toarrive, survive and thrive!" In July at theInternational Conference on Environmental Systems (SAE-ICES) in Rome, the grouppresented plans for a permanent settlement they believe can be built usingnear-term technologies and resources already available on Mars. The Mars Foundation is anon-profit organization made up of approximately 30 volunteer members, many ofthem scientists and engineers, and their effort is called the "HomesteadProject." According to the plans, thesettlement will rely on a curious blend of old and new technology: it will bebuilt with the aid of robots and run on nuclear energy, but will utilizematerials and building techniques reminiscent of earlier centuries on earth. Designs call for largemasonry arches and vaulted ceilings and domed skylights built with bricks bakedfrom Martian soil and stones cut from Martian quarries. Bruce Mackenzie, aco-founder of the group and a former member of the National Space Society's boardof directors, has been preaching the benefits of brick as an ideal buildingmaterial for a Martian settlement for years. "There are a number ofways you can make it, including just scooping up the soil, putting it in amold, and compressing and heating it," he said. "You can also melt itand make glass, and it can be glued together." Brick is also easy tomanufacture, Mackenzie said, and quality control for brick is not critical theway it is for other materials like fiberglass. Additional materials--suchas steel, aluminum, ceramic, glass and plastics--will also be needed for thesettlement's construction but the group believes these materials can bemanufactured using local Martian resources. "The industry and thetechnology that you need to produce these materials we'll have on hand,"said Joseph Palaia, an MIT nuclear engineering graduate student involved in thesettlement design. "It's based on last century's industrial engineeringtechnology." Compared to the crampedquarters within space shuttles and the International Space Station, the Martiansettlement will be large--approximately 27,000 square feet--and will initiallyhouse a dozen settlers. "We're not puttingthem in a trailer somewhere," said Mark Homnick, another Mars Foundationco-founder and a retired engineer who designed wafer-fabrication plants forIntel. "This thing is roomy and intended for permanent habitation." As more settlers arrive,the site will be expanded and will ultimately be able to accommodateapproximately 100 people, the group said. The settlement will becontained within an artificial atmosphere and pressurized using gases found onMars like carbon, nitrogen and argon, the group said. Oxygen will be strippedfrom water molecules using electrolysis and will also added to the mix. Conditions on Mars,however, are not exactly colonization-friendly and compared to Earth, in fact,they can seem downright hostile. Morning temperatures on the desert planet candip can below -76 degrees Farenheit (-60 Celsius) and enormous dust stormssweep across its barren rocky fields at speeds of over 60 miles per hour. A wispy atmosphere,combined with the lack of a planetary magnetic field, means that the airpressure on Mars is only a tiny fraction of Earth's and that harmful radiationfrom solar winds, cosmic rays and solar flares routinely bombard its surface.Factor in a minimum 6-month commute and a communications delay that can reachover 40-minutes and an obvious question arises: Why would anyone want togo to Mars? Let alone live there? One reason, said Palaia, isbecause it's there. "We will go to Mars for the challenge," he said. "Anything short of Martian settlement will be too easy anundertaking." Mars is also scientificallyinteresting--geologically and perhaps even biologically--and research conductedfrom a permanent base would be more efficient and less costly, the group said. Compared to a round-tripexploratory mission, the group believes a permanent settlement may also besafer. Broken parts, for example, could be manufactured and replaced on-site,eliminating the need to haul heavy spare parts or risks dangerous shippingdelays. "Anything that ishigh-mass and low tech, we're going to make there on Mars," said Palaia. "Anything that is really high tech--like sensors, motors and complexmechanism--most of those things are relatively low mass and can be imported fromEarth." The group recommendssending a minimum amount of resources to Mars beforehand, a process known asbootstrapping. When the settlers arrive on Mars, they can use the preparedmaterials, along with local resources, to construct the settlement. One possible scenario, thegroup proposes is to send small gas tanks ahead that store methane and oxygenextracted from the atmosphere. When the settlers arrive, they can then use thatequipment and stored gas to build things like steel production plants. Finally, Mars will be anintegral part of an inter-solar system economy that the group believes willdevelop within the next century, one based on the convergence of fourfrontiers: Earth, the Moon, asteroids, and Mars--including its own rockysatellites, Phobos and Deimos. Mars will catalyze thedevelopment of the other frontiers, said Homnick, acting as a supply house forvital resources like nitrogen, carbon dioxide and water for the moon andasteroids, places where such things are scarce or nonexistent. 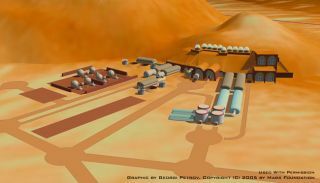 Many of the technologiesdeveloped for use on Mars will also have applications for the other frontiers,the group said. For example, life support systems and mining equipmentdeveloped for use on Mars could also be used on the moon. The group strongly supportsPresident Bush's Moon, Mars and Beyond vision and said they are not trying tocompete with NASA or any other space organization. "We kind of look atNASA and the European Space Agency as analogous to Lewis and Clark in the oldwest," Homnick said. "They blaze the trail, go out to explore and dothe science. Well, we are analogous to the pioneers--we follow the trail thatthey blazed, and we make the new frontier home and we add value." Instead, the group believesthat different agencies can benefit from one another and the colonization ofspace can be sped up. "We hope they succeedbecause they'll help us succeed," said Palaia. While drawing up plans forthe settlement, the group restricted themselves to existing--or extrapolationsof existing--technologies. Despite this limitation, the group believes the firststages of a Martian settlement could be in place as soon as 2025. After studying Martiansurvey data collected by NASA, the group chose Candor Chasma as a tentativesite for the settlement. Candor Chasma is a group of mesas located within anenormous canyon system on Mars known as the Valles Marineris. In addition to beinggeologically varied and scientifically interesting, Candor Chasma is alsorelatively flat and situated near the planet's equator, factors that areimportant for shuttle take offs and landings. The settlement will be anoasis built for posterity, one the group believes future generations will cometo regard as "a place of veneration and pilgrimage." With this in mind, thegroup's settlement designs call for the planting of a First Tree. The tree--thespecies of which will be determined later--will be planted in front of thesettlement's main entrance and its seeds will be transplanted to new parts ofthe settlement as it expands. "That was veryimportant to us," said Palaia. "We wanted to have this in there as asymbol of bringing life to [Mars]." Mackenzie and Homnick areboth middle-aged and doubt they'll be able to go to Mars themselves. ButPalaila, 25, thinks he may have a chance. "It's been my lifeobsession since I was very young," he said. Whether he'll be able toremain on Mars permanently, however, is another matter. "It's a point ofcontention with my wife," he said.